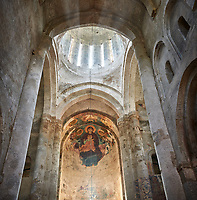 Pictures & images of the medieval Alaverdi St George Cathedral & monastery complex, 11th century, near Telavi, Georgia (country). 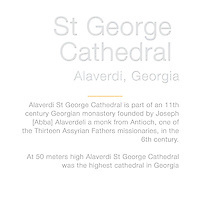 Alaverdi St George Cathedral is part of an 11th century Georgian monastery founded by Joseph [Abba] Alaverdeli a monk from Antioch, one of the Thirteen Assyrian Fathers missionaries, in the 6th century. At the time the village of Alaverdi was a pagan religious centre that worshipped the moon. 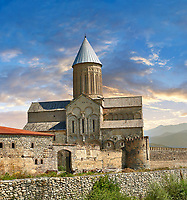 In the early 11th century the building of the great Alaverdi St George Cathedral was financed by King Kvirike the Great of Kakhetia, and it replaced a small 6th century church that stood on the site. At 50 meters high Alaverdi St George Cathedral was the highest cathedral in Georgia until 2004 when its height was beaten by the new cathedral of Tblisi. 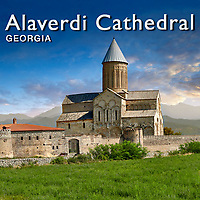 Surrounded by the fertile plain of the Alazani River valley with the Caucasus Mountains as a backdrop, the Alaverdi St George Cathedral is one of the great sites of Georgia. The outside of the cathedral has few decorative features but the interior was covered with frescoes, some of which have survived today. The high cupola makes for an imposing interior space. 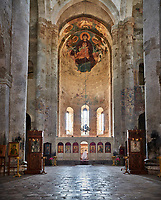 Above the altar in the apse isare the remains of a fresco depicting the Theotokos, the Virgin Mary, the Mother of God, and child. 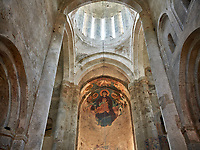 Other fragments of frescoes from the 11th, 15th, and 17th centuries survive inside. 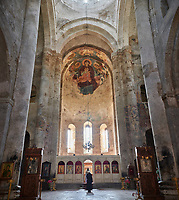 The Alaverdi St George Cathedral is at the centre of a monastery complex that still operates today as a convent. The fortified curtain walls are still in tact around the monastery as is its fortified gate house. These did not stop the Alaverdi Cathedral being destroyed several times by invaders which led to restoration being carried out in the 15th century. Around the 28th of September, every year the Alaverdi St George Cathedral is the centre of a religious harvest festival known as Alaverdoba. This celebrates the feast day of the feast day of the monasteries founder, St Joseph of Alaverdi. Situated in the heart of the world's oldest wine region, the monks of Alaverdi were famous for their wine known as Alaverdi Monastery Cellar wines. 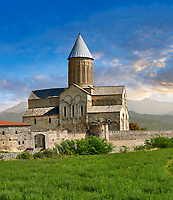 Download pictures & images of the medieval Alaverdi St George Cathedral & monastery complex, or buy as photo art prints.